It is time politicians and policymakers re-appraised the advantages of an activist industrial policy. The failures of Britain’s industrial policy record loom large in the collective memory and continue to be invoked by some at the merest suggestion that a more interventionist approach is now essential. The creation of British Leyland was certainly a mistake: industrial policy should never mean favouring monopoly over competition. But we have been too quick to forget the many productive government interventions which laid the groundwork for manufacturing success stories from which we continue to benefit as a nation to the present day. It is time politicians and policymakers re-appraised the advantages of an activist industrial policy and woke up to the dangers of the laissez faire fundamentalism that has become the default setting in Whitehall. In a new report for Civitas, I’ve described the various ways in which governments have successfully supported industry since 1945, but which are regarded by many today as old-fashioned and naïve. Not only were these interventions successful, but we continue to reap the benefits. The aerospace and automobile industries, our two biggest surviving manufacturing sectors, supporting tens of thousands of jobs, would not be where they are today if it had not been for the active support of successive governments – both Labour and Conservative. Without the direct public investment in commercial aircraft development after the Second World War, the aerospace hubs of Filton and Broughton would not be what they are today. Airbus would not even have a UK presence if Margaret Thatcher’s government did not subsidise the UK’s initial investment in the A320 aircraft in the 1980s. Thatcher’s government would go on to provide total support for BAe’s Airbus programmes of £700 million. This is a trivial sum compared to Airbus’ annual revenue of £1 billion and the economic activity its UK presence now generates. If government intervention helped Airbus UK, it has been essential for Rolls-Royce. Today the company is a massive global success, yet the firm was almost bankrupted when developing the RB211 engine which has been the foundation of its subsequent growth. Edward Heath’s government nationalised R-R in 1971 after it went into administration. Nationalisation and government funding allowed Rolls-Royce to keep developing the RB211 engine. Thatcher’s government continued to support the firm in 1980s, providing £437 million worth of launch aid between 1979 and 1988. By contrast, one of the first acts of the coalition was to withdraw a mere £80 million loan – money the government would have got back anyway – to the engineering firm Sheffield Forgemasters. Today, the coalition’s aerospace strategy does involve a range of useful policies from greater R&D funding from government to improve domestic supply chains; but there is no scope in the strategy for the direct investment in new technologies we had in the past and we so badly need now. This, however, is exactly what countries like China, Japan, Brazil and Canada are doing. The danger is that this state-backed overseas competition will lead to the further erosion of jobs and production in the UK which, once lost, are very difficult if not impossible to re-establish. 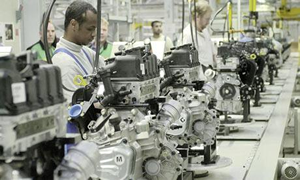 There is a similar lack of ambition in the coalition’s approach to the car industry which, despite its recent successes, suffers from a weak supply chain. More than a third of the value of UK automotive output is imported. Yet the government’s automotive sector strategy lacks any substantive measures to strengthen domestic suppliers, which is held back by a shortage of finance. Minsiters should consider introducing a nationwide public finance scheme designed specifically for automotive suppliers, modelled on the launch aid scheme that has been so successful for the aerospace sector. The reason we are successful in aerospace and car manufacturing today is that previous governments proactively carved out a comparative advantage for British companies in these sectors. What is required now is a similar ethos, not of ‘big’ or ‘all-knowing’ government, but of bold government, prepared to take the steps necessary today to ensure economic success tomorrow. Having worked in the auto industry, it does not surprise me that a third of the components are imported and that they should be. Ford, Honda, BMW also have major engine plants in the UK that export much of their production to assembly plants in other countries. That’s how a global industry works.